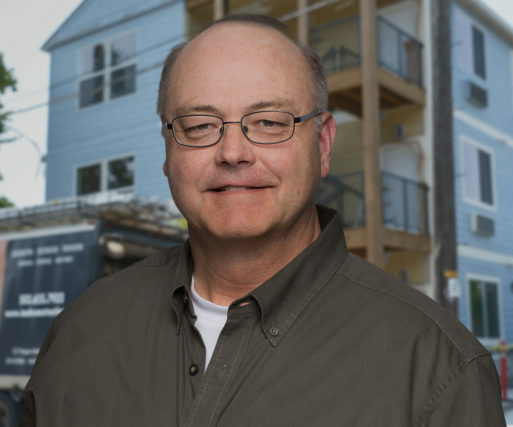 Bob Krippaehne is a trained construction professional with 30 years of building construction experience. He listens carefully, is a serious problem solver, and has a “can do” attitude. Having filled successive roles as labor worker, carpenter, field engineer, superintendent and project manager, he possesses exceptional skills at project programming; balancing schedule, budget, constructibility, quality and broad spectrum risk management goals for maximum delivered value to building Owners. His project expertise includes large-scale multi-family housing (wood frame, concrete frame, apartment, condominium, student housing, low income, rehabilitation), large scale civil infrastructure development, commercial building and academic institution construction. Summary metrics include having built: 2700+ housing units, 2.1 million+ SF of multi-family housing, in a dozen different cities throughout the Pacific Northwest, on seven college campuses, using multiple prime contract types (LS, GMP, D-B, CM/GC and CM-AR), and in association with dozens of major Northwest architecture firms. What can we restore for you?